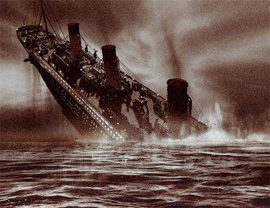 TotalMusic, the digital music distribution initiative created by Sony BMG and Universal Music Group, appears to be on life support – or worse. In the last few months the company has seen the two music executives who spearheaded the initiative jump ship, followed by a round of layoffs that included senior personnel. Yesterday Ruckus, a music streaming company acquired by TotalMusic last year, abruptly shut down. Repeated attempts to contact Michael Bebel, Ruckus’ CEO, have gone unanswered. It may be too soon to definitively put TotalMusic into the Deadpool, but things are not looking good for the company. The history of TotalMusic is dramatic, filled with failed deals, major strategy changes, and an antitrust lawsuit. Since forming, the company has proposed two new revenue models for music: the first was to offer end-users a large library of music for ‘free’, by building the cost of the music service into their music devices. That plan didn’t exactly work out – in early 2008 the Department of Justice launched an anti-trust probe which derailed the idea. Then, last summer, the company came back from the dead. The second new model was meant to serve as a departure from the way music has traditionally been licensed on the web. Historically, the major record labels have charged sites per-song fees for streaming, badgering everyone into submission with threats of lawsuits and steep penalties. Major sites like MySpace and imeem are held under this kind of agreement, as are many smaller sites which are having trouble sustaining themselves because of the high fees (even Pandora, a streaming music site that had the most popular iPhone application of 2008, has worried about having to shut down). In contrast to these per-song fees, TotalMusic was supposed to offer free streaming to sites in return for user data and all associated advertising revenue. In particular, the initiative was built from the start with Facebook in mind, offering the social network a chance to implement a music service for free while all of its competitors were paying hefty fees. But Facebook didn’t bite. The exact reason why is hazy – UMG and Sony were able to bring EMI on board, but were unable to get Warner, the last major label, to agree. We’ve also heard that Facebook was unwilling to hand over user data and ad revenues. Since the Facebook deal fell apart, the company has taken a turn for the worse. When we investigated the company last summer, we noted that four TotalMusic software engineers listed on LinkedIn had previously worked on MusicNow, another streaming music service that changed hands from Circuit City to AOL and ultimately had its customer base sold to the ‘legit’ Napster (presumably they had been brought in to apply their expertise to the new service). In the last month, two of the four employees have changed their profiles to indicate that they no longer work with TotalMusic. We’ve also heard that one of the company’s lead engineers was laid off in the last few days, prompting the sudden shutdown of Ruckus. Ruckus was quietly acquired last year by TotalMusic, and was meant to act as the foundation for the service’s backend. The operation closed down so quickly that some of the service’s participating universities weren’t even notified of the upcoming change (many campuses have been actively promoting Ruckus for years to try to curb piracy). But there has been some progress. 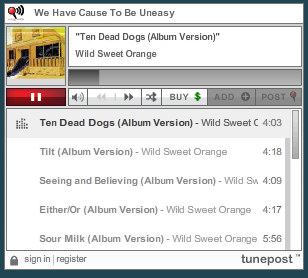 Last month TotalMusic soft-launched a new site called TunePost, which apparently offers streaming music through widgets. The service is in a private beta, but the company’s VP of Product Management, Jason Herskowitz, has been embedding widgets into his personal blog. This may be a sign that TotalMusic still has a pulse, but we’ve also heard that the company’s remaining employees are shopping around its technology to outside buyers – the embeds may simply be a way to show off the technology they’ve built. In any case, it’s hard to believe that in the current economy the music labels will continue to funnel money into what boils down to a music widget that has yet to launch to the public.